Pretty flint cottages in popular unspoilt coastal village. Well equipped with ample off road parking. 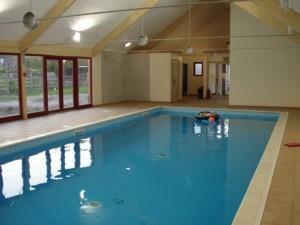 Visitors can enjoy our luxury indoor heated swimming pool, games room, play area, bike store and laundry facilities. We live on site and can share our local knowledge and resolve any problems quickly. Weybourne's position is excellent for touring North Norfolk and all the popular tourist attractions. An ideal base for families, walkers and birdwatchers. Weybourne has one restaurant, pub, shop. Steam railway link with Holt and Sheringham, military museum, church and beach all within walking distance. Sorry no pets or smoking. Sleeps 2-7. Open all year. Coming through Holt town centre, turn left after garage. 3 miles later as you enter Weybourne, Home Farm is on your left. From Sheringham travel along the coast road into Weybourne. Take the left turn at the church, bear right. Home Farm is on your right.